Edie has been serving clients in the Employee Benefits Practice Group within the Labor and Employment Department for more than ten years. Edie strives to understand clients' objectives and applies her experiences to develop a practical solution to meet their needs while limiting plan and administrative complexity. 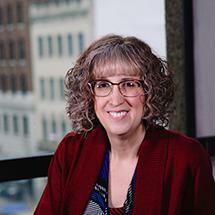 The primary focus of her practice is designing retirement and welfare plans, and providing advice regarding compliance and administration issues. She has represented clients before the Internal Revenue Service and the Department of Labor. Edie also provides benefits counseling for corporate acquisitions, plan amendments and terminations.